1Department of Internal Medicine, State University of New York, Downstate Medical center, Brooklyn, N.Y, U.S.A.
2Division of Hematology-Oncology, Department of Internal Medicine, Brookdale University hospital and medical center, Brooklyn, N.Y, U.S.A.
3Department of Pathology, Brookdale University hospital and medical center, Brooklyn, N.Y, U.S.A.
4Department of Internal Medicine, Brookdale University hospital and medical center, Brooklyn, N.Y, U.S.A.
Carcinoid tumors are rare neuroendocrine tumors that arise from neural crest amine precursor uptake decarboxylation cells. Most of carcinoid tumors originate in the midgut. The vasoactive secretory products of carcinoid tumor upon metastasis to liver reach systemic circulation as they bypass the metabolism by liver. 50% of patients with carcinoid syndrome eventually develop carcinoid heart disease. We here present a rare case of carcinoid tumor with metastasis to liver that solely presented with right heart failure. The patient did not have any symptoms of typical carcinoid syndrome features such as flushing, diarrhea, and bronchoconstriction. Basson MD, Ahlman H, Wangberg B, Modlin IM. 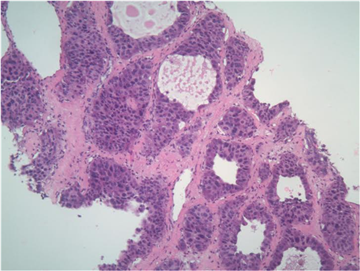 Biology and management of the midgut carcinoid. The American journal of surgery. 1993 Feb 28; 165(2): 288-97. Fox DJ, Khattar RS. Carcinoid heart disease: presentation, diagnosis, and management. Heart. 2004 Oct 1; 90(10): 1224-8. Lachter JH, Lavy A, Eidelman S. Right heart failure as the sole presentation of carcinoid syndrome. International journal of cardiology. 1989 Oct 31; 25(1): 129-30. Strickman NE, Rossi PA, Massumkhani GA, Hall RJ. Carcinoid heart disease: a clinical, pathologic, and therapeutic update. Current problems in cardiology. 1982 Feb 28;6(11):10-42. Spatz M. PATHOGENETIC STUDIES OF EXPERIMENTALLY INDUCED HEART LESIONS AND THEIR RELATION TO THE CARCINOID SYNDROME. Laboratory investigation; a journal of technical methods and pathology. 1964 Mar; 13:288. Schweizer W, Gloor F, Bertrab RV, Dubach UC. Carcinoid heart disease with left-sided lesions. Circulation. 1964 Feb 1; 29(2): 253-7.